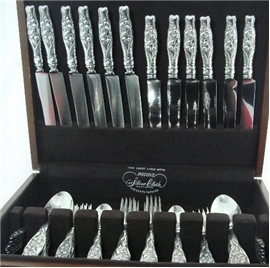 (SOLD)OLD flatware service for 12 in the handsome Lily of the Valley pattern by Whiting. Click to view detail Description. LILY OF THE VALLEY LUNCH FORK, Mono, 6 3/4:"
LUNCH FORK, Mono, 6 3/4:"
LILY OF THE VALLEY LUNCH FORK, 6 3/4"
LILY OF THE VALLEY TEASPOON, Mono, 5 7/8"
LILY OF THE VALLEY COFFEE SPOON, Mono, 5 1/4"
COFFEE SPOON, Mono, 5 1/4"
LILY OF THE VALLEY DESSERT SPOON, Mono, 6 7/8"
DESSERT SPOON, Mono, 6 7/8"